The application VeryPDF PDF Editor is an excellent application which is able to edit PDF document in PDF comment, PDF content, PDF annotation, etc., view PDF document as a professional viewer and convert PDF to image like a converter. 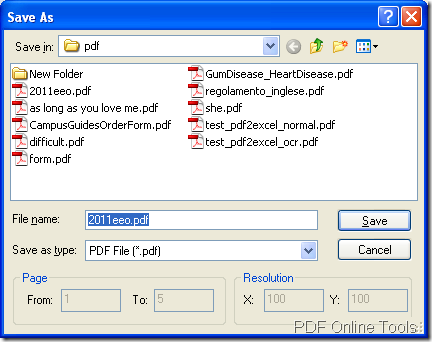 Before using PDF Editor, please download it via clicking here. Then you need to double click the installer of it and find a destination for the application on your computer disk to install it. To edit PDF document, you need to open PDF Editor by double clicking its icon. Then you will see the main interface of it on your screen like the one shown in Figure 1. If you need to add PDF comment or PDF content, please click Edit Comment or Edit Content button or click Tools—Edit Comment or Edit Content to open comment or content status. In comment toolbar, you can see there are four buttons which are activated. When you click Add Textbox or click Tools—Comment—Text Box, you need to draw a rectangle in document panel according to your need. Then please double click the rectangle to add PDF comment in the textbox. You can easily change the size and location by dragging the middle or corner of the rectangle. To edit the textbox, please right click it in non-edit state and click Properties option in popup floating item and then you will see Properties dialog box in which you can set different parameters for textbox. When you add note, stamp or graphics comment in PDF and edit them, the operations are the same. But if you want to add comments into them, you need to double click the one you added and input the comment in popup comment window which can also be dragged to change size and location. Then please click Save button in toolbar or click File—Save to save the changes you have made. You need to click File—Save as to open Save as dialog box which is shown in Figure 3. Please save the newly created PDF document in this dialog box. So you can edit PDF like this way. If you want to use PDF Editor to view PDF document, you can use three ways to open PDF document in this application. Right click the PDF document that you want to view and click Open with—Choose Program to open Open with window in which you need to choose PDF Editor as the open tool. 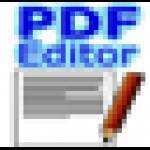 Open PDF Editor at first and click File—Open or click Open button in toolbar to open file picker window in which you can choose the PDF document you want to view. In the opened application interface, you can also use the shortcut key Ctrl+ O to open the same dialog box. 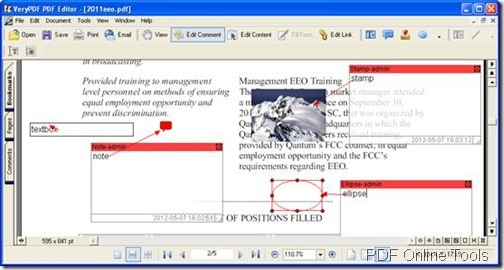 Directly drag the document into the application PDF Editor. Then you can freely change the page size of PDF document, view any page of PDF, use bookmarks, pages, etc. formats to view PDF, with the toolbar and . PDF Editor can also convert PDF to image of different formats such as BMP, JPG, PCX, WMF, etc. The operations are easy enough. When you add PDF document into PDF Editor, if you don’t want to edit the document, you just need to click File—Save as or use the shortcut key Shift+ Control+ S to open Save as dialog box which is shown in Figure 3. In Save in dropdown list, you need to choose the output location for the target file. In File name edit box, please input the file name. In Save as type dropdown list, please choose the output format such as BMP. You can also decide to convert several pages of PDF into image by specifying the page number in From and To edit boxes of Page group box. You can also set the resolution for target image in Resolution group box. Then click Save button. If you have any questions about this application, you can read its user manual or you can enter its homepage to get more information about this application.